Multiple myeloma is the second most common (10-15% of all) haematological cancer.1 It is responsible for 15-20% of deaths from haematological cancer and about 2% of all deaths from cancer.1 Recent improved understanding of the pathogenesis of myeloma has led to the development of new treatments. Although myeloma remains an incurable cancer, survival is improving, and newly diagnosed patients are now projected to live for around five years.2 With an increasing number of survivors, it important for health professionals to understand the disease and current treatments. We have summarised guidelines, meta-analyses, and randomised controlled trials to give an up to date review of myeloma. We searched Medline and the Cochrane collaboration, using the terms “myeloma” and “multiple myeloma”. Wherever possible, we used evidence from randomised controlled trials, systemic reviews, and meta-analyses, focusing mainly on articles published in the past five years, to provide an up to date summary. We have also referenced expert review articles and included opinion based on clinical experience. What is myeloma and who gets it? What is the underlying pathophysiology? What causes bone disease and hypercalcaemia in myeloma? Imbalanced bone remodelling in the myeloma bone marrow is caused by increased osteoclast activity, together with reduced osteoblast function. Myeloma cells cause an increased production of osteoclast activating factors and cytokines that inhibit osteoblast differentiation. The unopposed osteolysis is also responsible for hypercalcaemia. Common presentations are symptoms of anaemia (seen in 75% of patients at diagnosis), hypercalcaemia (30%), renal impairment (25%), and bone disease (70%).3 9 10 Bone manifestations can present as painful lytic lesions, vertebral crush fractures, or long bone fractures (fig 2⇓). Spinal cord compression due to retropulsion of pathological vertebral fractures or extramedullary soft tissue plasmacytomas occurs in 5% of patients with myeloma.3 Hypercalcaemia, acute renal failure, and cord compression are medical emergencies, and prompt diagnosis and treatment are vital to minimise long term organ damage. High paraprotein values can cause symptoms of hyperviscosity (headaches, epistaxis, blurred vision, and confusion), while decreased humoral immunity results in recurrent bacterial infections. Thirty per cent of cases are diagnosed after an incidental finding of raised erythrocyte sedimentation rate, total protein, or immunoglobulins. Box 1 summarises the International Myeloma Working Group diagnostic criteria for myeloma, asymptomatic myeloma, and MGUS.13 MGUS is diagnosed when plasma cell infiltration and paraprotein concentrations are low and the patient has no evidence of myeloma, such as hypercalcaemia, renal insufficiency, anaemia, or bone lesions. Patients with MGUS have around a 1% chance each year of progressing to myeloma.14 When plasma cell or monoclonal protein concentrations are higher but there is no myeloma related organ or tissue impairment, the condition is referred to as asymptomatic myeloma. This condition carries a 10% chance each year of progression to symptomatic myeloma.3 A polyclonal rise in immunoglobulins reflects an acute inflammatory response and not MGUS or myeloma. Box 2 summarises the investigations to perform when a diagnosis of myeloma is being considered, highlighting screening tests for general practitioners. Clinical suspicion of myeloma, combined with one or more of anaemia, impaired renal function, hypercalcaemia, lytic lesions on radiography, or detection of a paraprotein or urinary Bence Jones proteins warrants referral to a haematology clinic. What are the prognostic factors? Although the introduction of novel therapeutic agents has transformed the outlook for many patients, myeloma remains a heterogeneous disease. Some patients will live for more than eight years after diagnosis, whereas a subset with high risk disease will die within 24 months.2 The international staging system defines three risk categories based on serum concentrations of β2 microglobulin and albumin (box 3).16 Specific genetic lesions, or gene signatures, are associated with worse outcomes.2 IgH translocations involving chromosomes 4 and 16, termed t(4;14) and t(14;16) are considered high risk and are associated with a worse prognosis. The tumour suppressor gene P53 is located on the short arm, or p arm, of chromosome 17, and deletion of this arm (del 17p) is also associated with a worse outcome. Patients with the t(11;14) or t(6;14) IgH translocations are considered to have standard risk disease, as are patients with hyperdiploidy. Patients with MGUS and asymptomatic myeloma are observed but not treated until they develop symptomatic myeloma. No intervention has been found to delay or prevent the progression of MGUS to myeloma.3 14 Patients with asymptomatic myeloma should be followed up under the supervision of a consultant haematologist. Randomised controlled trials found that treating asymptomatic myeloma with chemotherapy had no impact on survival.3 Current trials are investigating the use of novel agents to treat those at high risk of progression to symptomatic myeloma, and patients should be offered entry into these if available.3 British Committee for Standards in Haematology (BCSH) guidelines recommend monitoring patients with MGUS who are at low risk of progression to myeloma in primary care, whereas those at high risk of progression should be monitored under supervision of a consultant haematologist. 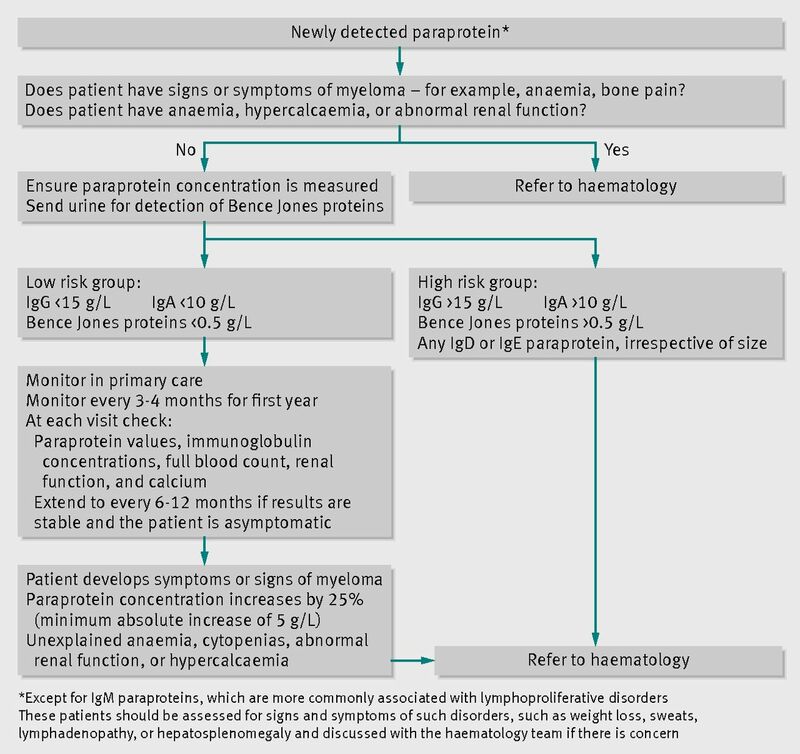 Fig 3⇓ shows an algorithm for the management of a newly detected paraprotein, including frequency of follow-up for patients with MGUS in primary care and triggers for referral to haematology. The past decade has seen an unprecedented advance in the treatment of symptomatic myeloma, with the introduction of bortezomib (a proteasome inhibitor) and thalidomide and lenalidomide (immunomodulatory drugs) (table⇓). These agents are now the mainstay of treatment. Most patients respond to initial treatment and enter a period of disease stability,17 19 20 21 22 which is generally associated with good quality of life. Because of the lack of curative treatment, relapse is inevitable, but at least half of patients respond to chemotherapy a second time, using similar or different drugs. Subsequent relapses become increasingly less responsive to treatment, until refractory end stage disease ensues, sometimes with extramedullary manifestations and cytopenias (fig 4⇓). At most stages of treatment clinical trials are available and should be offered to patients if they are eligible. The approach to treating newly diagnosed symptomatic myeloma depends on age and comorbidities. Initial chemotherapy regimens aim to achieve the deepest response with the lowest toxicity, and for patients who are young (generally <65 years) and fit enough, this is consolidated with high dose chemotherapy with autologous stem cell transplantation. Older patients, or those with serious comorbidity, who are not fit enough to undergo autologous transplantation are treated with chemotherapy only. Response to treatment is graded according to the reduction in paraproteins or light chains (box 4). Box 5 lists the major side effects of treatments. *Symptoms must be monitored vigilantly—the dose may need to be reduced or the schedule changed. †Because this drug has teratogenic effects, conditions of a pregnancy prevention programme must be fulfilled for all male and female patients before the drug is prescribed. Several large phase III trials have established the use of high dose chemotherapy and autologous stem cell transplantation as standard of care in patients deemed young and fit enough.23 Initial induction therapy should preserve haemopoietic stem cell function so that stem cells can be collected. The traditional vincristine-doxorubicin-dexamethasone regimen has been superseded by new agents. Several randomised studies have shown that induction regimens incorporating one or more novel agent induce higher disease responses before and after autologous stem cell transplantation and extend progression-free survival.17 19 20 22 The best evidence exists for regimens that contain bortezomib, which are used with dexamethasone and usually a third agent—thalidomide, doxorubicin, or cyclophosphamide.24 25 The thalidomide based regimen, cyclophosphamide-thalidomide-dexamethasone, is widely used in the United Kingdom, as a result of the recent Myeloma IX study. This practice may change, however, when the results of the current national studies—Myeloma XI and PADIMAC—are released. Myeloma XI is investigating a lenalidomide combination, whereas PADIMAC is using a bortezomib based induction protocol. What are the treatment options in patients unsuitable for transplantation? Management of relapse depends on previous treatment, length of remission, and persisting toxicities and comorbidities. Generally, the previous treatment is used again only if it had resulted in a long progression-free survival (12 months or more). Novel agents are the mainstay of treatment at relapse and are more efficacious if combined with corticosteroids, and sometimes an alkylating agent.3 In general, first relapse is treated with a bortezomib regimen, whereas lenalidomide is used for subsequent relapse, in accordance with National Institute for Health and Care Excellence recommendations in England and Wales. A second autologous stem cell transplant may be considered in patients who are young and fit enough and who achieved a long (≥18 months) remission after first transplant. The outlook for patients who do not respond to immunomodulatory agents and bortezomib is poor, with a median overall survival of nine months.30 This highlights the importance of entering these patients into clinical trials, to allow access to newer treatments and evaluate their efficacy. How should myeloma presenting with acute kidney injury be managed? How should vertebral disease be managed? If cord compression is suspected, dexamethasone should be started immediately,3 followed by urgent imaging of the spine. Bone related cord compression requires urgent discussion with neurosurgical and orthopaedic teams to consider decompression or stabilisation of the spine. Where cord compression is caused by extramedullary tumour, chemotherapy or radiotherapy (or both) may be preferable. Symptoms of hyperviscosity are caused by high concentrations of paraprotein (IgA >40 g/L, IgG >60 g/L).3 If symptomatic, urgent plasma exchange should be performed and systemic antimyeloma treatment started. If plasmapheresis is unavailable, isovolaemic venesection may be beneficial. How is bone disease managed? What supportive care measures are important? Pain control is often a major aspect of clinical care, owing to bone disease or side effects of treatment. Radiotherapy can effectively treat painful skeletal lesions, as well as soft tissue disease. Vertebral augmentation and bisphosphonates may be beneficial. Opiates are often needed to manage bone pain. Avoid non-steroidal anti-inflammatory drugs because of potentially serious renal toxicity.9 For neuropathic pain, calcium channel blockers (such as gabapentin) or serotonin noradrenaline reuptake inhibitors (such as amitriptyline) may help.9 Early engagement with the multidisciplinary team is important, for symptom control and psychosocial support. Anaemia can be managed with transfusions or erythropoietic stimulatory agents. BCSH guidelines suggest a trial of such agents if haemoglobin is <100 g/L.9 Myeloma and its treatment lower immunity, and 10% of patients die, largely of infection, within the first 60 days. Patient education and 24 hour access to haematology advice are important preventive measures, as is prompt initiation of antibiotics. What new treatments can we expect? As new treatments continue to evolve, can myeloma be cured, or will it be treated as a “chronic disease”? Can the increased understanding of the genetics of myeloma lead to a risk stratified treatment approach? Will consolidation and maintenance treatment improve overall survival and become routine practice? Triple combinations of drugs are now the norm—would four or more drugs be better? With the development of new drugs, should autologous stem cell transplantation early on in treatment still be the gold standard? We thank Manuel Rodriguez-Justo for supplying the bone marrow trephine images, and Jaimal Kothari for reviewing the article. Contributors: DS and KY conceived and designed the article, drafted and revised it, and approved the final manuscript. KY is guarantor. Group IMW. Criteria for the classification of monoclonal gammopathies, multiple myeloma and related disorders: a report of the International Myeloma Working Group. Br J Haematol 2003;121:749-57. Bergsagel PL, Mateos MV, Gutierrez NC, Rajkumar SV, San Miguel JF. Improving overall survival and overcoming adverse prognosis in the treatment of cytogenetically high-risk multiple myeloma. Blood 2013;121:884-92. Bird JM, Owen RG, D’Sa S, Snowden JA, Pratt G, Ashcroft J, et al. Guidelines for the diagnosis and management of multiple myeloma 2011. Br J Haematol2011;154:32-75. Waxman AJ, Mink PJ, Devesa SS, Anderson WF, Weiss BM, Kristinsson SY, et al. Racial disparities in incidence and outcome in multiple myeloma: a population-based study. Blood2010;116:5501-6. Alexander DD, Mink PJ, Adami HO, Cole P, Mandel JS, Oken MM, et al. Multiple myeloma: a review of the epidemiologic literature. Int J Cancer2007;120(suppl 12):40-61. Bochtler T, Hegenbart U, Cremer FW, Heiss C, Benner A, Hose D, et al. Evaluation of the cytogenetic aberration pattern in amyloid light chain amyloidosis as compared with monoclonal gammopathy of undetermined significance reveals common pathways of karyotypic instability. Blood2008;111:4700-5. Podar K, Chauhan D, Anderson KC. Bone marrow microenvironment and the identification of new targets for myeloma therapy. Leukemia2009;23:10-24. Stringer S, Basnayake K, Hutchison C, Cockwell P. Recent advances in the pathogenesis and management of cast nephropathy (myeloma kidney). Bone Marrow Res2011;2011:493697. Snowden JA, Ahmedzai SH, Ashcroft J, D’Sa S, Littlewood T, Low E, et al. Guidelines for supportive care in multiple myeloma 2011. Br J Haematol2011;154:76-103. Morgan GJ, Davies FE, Gregory WM, Szubert AJ, Bell SE, Drayson MT, et al. Effects of induction and maintenance plus long-term bisphosphonates on bone disease in patients with multiple myeloma: the Medical Research Council Myeloma IX Trial. Blood2012;119:5374-83. Kariyawasan CC, Hughes DA, Jayatillake MM, Mehta AB. Multiple myeloma: causes and consequences of delay in diagnosis. QJM2007;100:635-40. National Cancer Intelligence Network. Routes to diagnosis, 2006-2008. NCIN information supplement. 2012. www.ncin.org.uk/publications/routes_to_diagnosis. Palumbo A, Sezer O, Kyle R, Miguel JS, Orlowski RZ, Moreau P, et al. International Myeloma Working Group guidelines for the management of multiple myeloma patients ineligible for standard high-dose chemotherapy with autologous stem cell transplantation. Leukemia2009;23:1716-30. Bird J, Behrens J, Westin J, Turesson I, Drayson M, Beetham R, et al. UK Myeloma Forum (UKMF) and Nordic Myeloma Study Group (NMSG): guidelines for the investigation of newly detected M-proteins and the management of monoclonal gammopathy of undetermined significance (MGUS). Br J Haematol2009;147:22-42. Dimopoulos M, Terpos E, Comenzo RL, Tosi P, Beksac M, Sezer O, et al. International myeloma working group consensus statement and guidelines regarding the current role of imaging techniques in the diagnosis and monitoring of multiple myeloma. Leukemia 2009;23:1545-56. Greipp PR, San Miguel J, Durie BG, Crowley JJ, Barlogie B, Bladé J, et al. International staging system for multiple myeloma. J Clin Oncol2005;23:3412-20. Cavo M, Rajkumar SV, Palumbo A, Moreau P, Orlowski R, Bladé J, et al. International Myeloma Working Group consensus approach to the treatment of multiple myeloma patients who are candidates for autologous stem cell transplantation. Blood2011;117:6063-73. Brenner H, Gondos A, Pulte D. Recent major improvement in long-term survival of younger patients with multiple myeloma. Blood2008;111:2521-6. Rajkumar SV, Rosiñol L, Hussein M, Catalano J, Jedrzejczak W, Lucy L, et al. Multicenter, randomized, double-blind, placebo-controlled study of thalidomide plus dexamethasone compared with dexamethasone as initial therapy for newly diagnosed multiple myeloma. J Clin Oncol2008;26:2171-7. Rajkumar SV, Jacobus S, Callander NS, Fonseca R, Vesole DH, Williams ME, et al. Lenalidomide plus high-dose dexamethasone versus lenalidomide plus low-dose dexamethasone as initial therapy for newly diagnosed multiple myeloma: an open-label randomised controlled trial. Lancet Oncol2010;11:29-37. San Miguel JF, Schlag R, Khuageva NK, Dimopoulos MA, Shpilberg O, Kropff M, et al. Bortezomib plus melphalan and prednisone for initial treatment of multiple myeloma. N Engl J Med2008;359:906-17. Harousseau JL, Attal M, Avet-Loiseau H, Marit G, Caillot D, Mohty M, et al. Bortezomib plus dexamethasone is superior to vincristine plus doxorubicin plus dexamethasone as induction treatment prior to autologous stem-cell transplantation in newly diagnosed multiple myeloma: results of the IFM 2005-01 phase III trial. J Clin Oncol2010;28:4621-9. Child JA, Morgan GJ, Davies FE, Owen RG, Bell SE, Hawkins K, et al. High-dose chemotherapy with hematopoietic stem-cell rescue for multiple myeloma. N Engl J Med2003;348:1875-83. Cavo M, Tacchetti P, Patriarca F, Petrucci MT, Pantani L, Galli M, et al. Bortezomib with thalidomide plus dexamethasone compared with thalidomide plus dexamethasone as induction therapy before, and consolidation therapy after, double autologous stem-cell transplantation in newly diagnosed multiple myeloma: a randomised phase 3 study. Lancet2010;376:2075-85. Richardson PG, Weller E, Lonial S, Jakubowiak AJ, Jagannath S, Raje NS, et al. Lenalidomide, bortezomib, and dexamethasone combination therapy in patients with newly diagnosed multiple myeloma. Blood2010;116:679-86. Attal M, Harousseau JL, Facon T, Guilhot F, Doyen C, Fuzibet JG, et al. Single versus double autologous stem-cell transplantation for multiple myeloma. N Engl J Med2003;349:2495-502. Cavo M, Tosi P, Zamagni E, Cellini C, Tacchetti P, Patriarca F, et al. Prospective, randomized study of single compared with double autologous stem-cell transplantation for multiple myeloma: Bologna 96 clinical study. J Clin Oncol2007;25:2434-41. Lokhorst H, Einsele H, Vesole D, Bruno B, San Miguel J, Pérez-Simon JA, et al. International Myeloma Working Group consensus statement regarding the current status of allogeneic stem-cell transplantation for multiple myeloma. J Clin Oncol2010;28:4521-30. Morgan GJ, Davies FE, Gregory WM, Russell NH, Bell SE, Szubert AJ, et al. Cyclophosphamide, thalidomide, and dexamethasone (CTD) as initial therapy for patients with multiple myeloma unsuitable for autologous transplantation. Blood 2011;118:1231-8. Kumar SK, Lee JH, Lahuerta JJ, Morgan G, Richardson PG, Crowley J, et al. Risk of progression and survival in multiple myeloma relapsing after therapy with IMiDs and bortezomib: a multicenter international myeloma working group study. Leukemia 2012;26:149-57. Hutchison CA, Cockwell P, Stringer S, Bradwell A, Cook M, Gertz MA, et al. Early reduction of serum-free light chains associates with renal recovery in myeloma kidney. J Am Soc Nephrol2011;22:1129-36. Dimopoulos MA, Roussou M, Gkotzamanidou M, Nikitas N, Psimenou E, Mparmparoussi D, et al. The role of novel agents on the reversibility of renal impairment in newly diagnosed symptomatic patients with multiple myeloma. Leukemia 2013;27:423-9. Dimopoulos MA, Terpos E, Chanan-Khan A, Leung N, Ludwig H, Jagannath S, et al. Renal impairment in patients with multiple myeloma: a consensus statement on behalf of the International Myeloma Working Group. J Clin Oncol2010;28:4976-84. Clark WF, Stewart AK, Rock GA, Sternbach M, Sutton DM, Barrett BJ, et al. Plasma exchange when myeloma presents as acute renal failure: a randomized, controlled trial. Ann Intern Med2005;143:777-84. Hutchison CA, Cook M, Heyne N, Weisel K, Billingham L, Bradwell A, et al. European trial of free light chain removal by extended haemodialysis in cast nephropathy (EuLITE): a randomised control trial. Trials2008;9:55. Hussein MA, Vrionis FD, Allison R, Berenson J, Berven S, Erdem E, et al. The role of vertebral augmentation in multiple myeloma: International Myeloma Working Group consensus statement. Leukemia2008;22:1479-84. Anselmetti GC, Marcia S, Saba L, Muto M, Bonaldi G, Carpeggiani P, et al. Percutaneous vertebroplasty: multi-centric results from EVEREST experience in large cohort of patients. Eur J Radiol2012;81:4083-6. Ludwig H, Durie BG, McCarthy P, Palumbo A, San Miguel J, Barlogie B, et al. IMWG consensus on maintenance therapy in multiple myeloma. Blood2012;119:3003-15. Richardson PG, Moreau P, Jakubowiak A, Raab M, Facon T, Vij R, et al. A phase 2 study of elotuzumab (Elo) in combination with lenalidomide and low-dose dexamethasone (Ld) in patients (pts) with relapsed/refractory multiple myeloma (R/R MM): updated results. ASH2012. http://abstracts.hematologylibrary.org/cgi/content/short/120/21/202. Plesner T, Lokhorst H, Gimsing P, Nahi H, Lisby S, Richardson PG. Daratumumab, a CD38 monoclonal antibody in patients with multiple myeloma—data from a dose-escalation phase I/II study. ASH2012. http://abstracts.hematologylibrary.org/cgi/content/abstract/120/21/73. Raje N, Roodman GD. Advances in the biology and treatment of bone disease in multiple myeloma. Clin Cancer Res2011;17:1278-86. Durie BG, Harousseau JL, Miguel JS, Bladé J, Barlogie B, Anderson K, et al. International uniform response criteria for multiple myeloma. Leukemia 2006;20:1467-73.